Seventy years ago, 76 servicemen fled from the German Stalag Luft 3 camp through a long tunnel. Only three managed to reach safety and of the 73 recaptured, 50 were shot by Hitler’s notorious Gestapo. One of those 50 was a Flt Lt Romas Marcinkus, a pilot who was serving on 1(F) Sqn RAF. 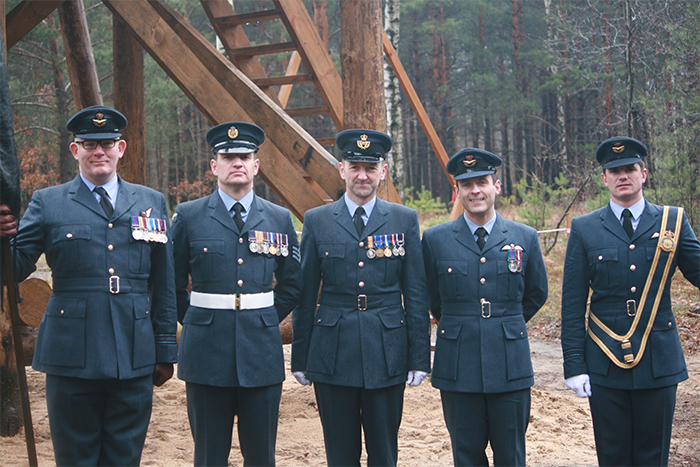 To commemorate him and the other 49 airmen who lost their lives during this audacious escape, members of 1(F) Sqn travelled to Zagan, Poland, where the infamous Stalag Luft 3 POW camp was situated. As part of the 70th Anniversary of the ‘Great Escape’ from Stalag Luft 3, they joined hundreds of people that had travelled from around the world to gather and lay wreaths at the exit of the tunnel “Harry” in an act of remembrance for the dead. On the occasion the 1(F) Sqn Ceremonial Standard Party, along with other Sqns representing their airmen lost during this escape, proudly paraded its Sqn Colours. Later on that day the Sqn once again paraded its Colours at a Reception and Dinner held at the Zagan Palace and hosted by Her Majesty’s Ambassador to the Republic of Poland, His Excellency Robin Barnett and the British Defence Attaché, Gp Capt David Houghton. The Reception and Dinner were particularly poignant as serving POW airmen of Stalag Luft 3 were in attendance. As the founder Sqn of the RFC, 1(F) Sqn members pride themselves in keeping its history alive and in particular the current Sqn OC, Wg Cdr Flewin, is especially passionate about studying and commemorating its history. This event was a special moment to remember all the airmen involved in this escape and in particular for 1(F) Sqn personnel to bring to life the story of Flt Lt Ramos Marcinkus RAF. Wg Cdr Flewin said “it was extremely humbling and a real privilege to stand on the site where those courageous men carried out such an audacious escape. As the first Lithuanian to serve in the RAF, Flt Lt Romas Marcinkus very much lived the 1(F) Sqn moto, ‘In Omnibus Princeps’ – ‘First In All Things’. It is extremely important to look back and study the honourable and brave actions of our forebears, and today I am glad that we could remember Romas’ brave actions by parading the 1(F) Sqn standard as we remember not only him, but also all those involved in the Great Escape 70 years ago”. Romas Marcinkus was born in Lithuania on 22 Jul 1907, the eldest of 5 children. In 1928 Marcinkus graduated from the Kaunas Military School and received a commission as an infantry second lieutenant. From 1930 until 1932 he attended ‘the Vytautas’, the Great Military Institute's aviation department, and became a military pilot. While serving in the Lithuanian Air Force, Marcinkus qualified as a paratrooper instructor and headed the Aviation sport and physical education department; he was a talented football player and during his later years coached a football team. In 1934 Marcinkus was transferred to the air reconnaissance department, there he started improving his expertise in independent flying, mapping, photography, and weapon systems. A few months before the Soviet occupation of Lithuania early in the Second World War, Marcinkus left Lithuania and enlisted in the French Air Force. After the Battle of France and the French capitulation, Marcinkus escaped to Britain. In October 1940, Marcinkus reached Liverpool and from there travelled on to London. 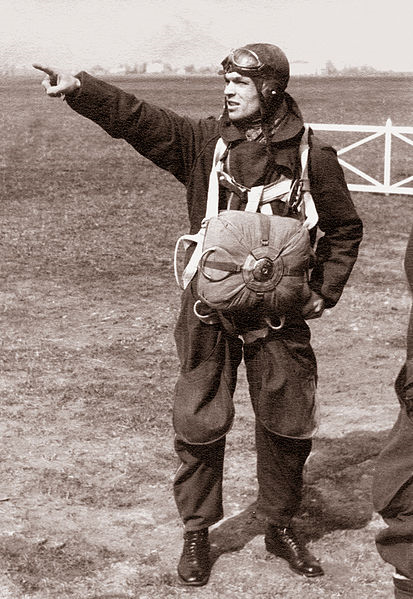 On 24 December of the same year, Marcinkus became a pilot of the RAF. To achieve that, he changed some of his personal data; he stated that he was three years younger; otherwise he would have been too old for service in the RAF. At that time his homeland of Lithuania had already lost its independence and the Lithuanian Air Force was rapidly liquidated by its occupiers. “I was transferred to the night fighters - at that time the most dangerous kind of military aviation. But I like danger - I faced danger during my entire life, in flying, sports, and personal life. With this I am satisfied, but...I am lacking warmth and the comfort of my personal life in this country of "cold slob weather and so called correctness". In June, Marcinkus and his Sqn members engaged in prolonged air combat with Germans. As later reports confirm, the Germans lost 4 Me 109 fighter aircraft, one of which was shot down by Marcinkus. The original report submitted by Marcinkus claiming one Me 109 shot down on 21 June 1941 is held in The National Archives; he states that he fired two short bursts from his guns from 100 yards behind the German. The last mission Marcinkus carried out as a RAF pilot was on 12 February 1942. At Stalag Luft 3 Marcinkus became an active member of an underground group of prisoners who organised and executed the Great Escape. Marcinkus was responsible for analyzing the German railway schedules - a vital part of the plan. On the night of 25 March 1944, Marcinkus became one of 76 servicemen who escaped the Stalag. After several days he was recaptured by the Gestapo and executed. More of Flt Lt Romas Marcinkus’ story and photographs are to be found in the 1(F) Sqn History Room at RAF Leuchars. 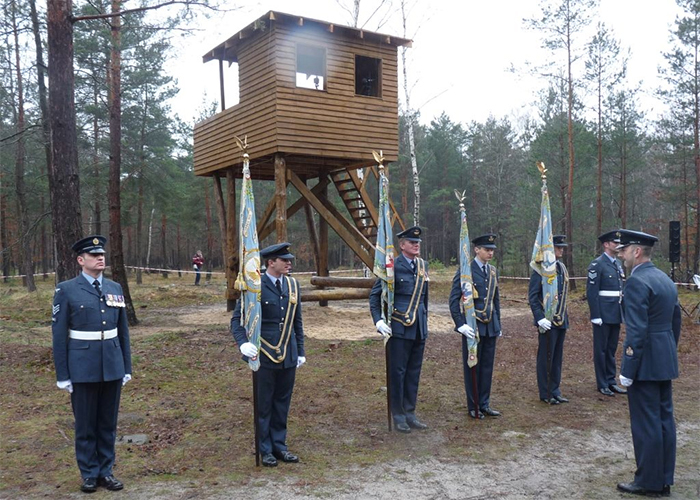 Under the direction of 1(F) Sqn’s WO Graham Webster, Sqn Standards paraded in front of one of the Guard Towers at the site of Stalag Luft 3. 1(F) Sqn representatives at Stalag Luft 3.